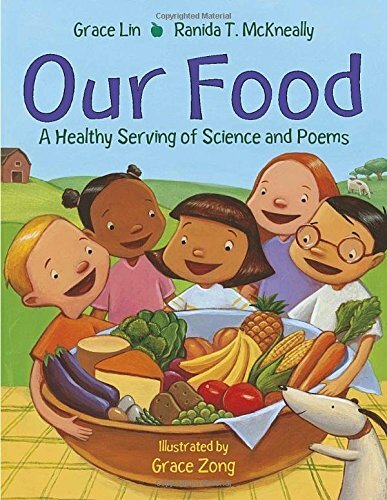 Summary: Each two-page spread includes a large, colorful illustration, a haiku poem, and a question such as “Why are so many vegetables green?” and “What makes a grain a grain?” Each question is answered with several paragraphs of kid-friendly text. Five food groups are covered: fruits, vegetables, dairy, protein foods, and grains. The book supports the USDA recommendations for eating these different types of foods. The last couple pages encourage eating a variety of healthy foods and explain a little more about the food groups. Includes a glossary. 40 pages; grades K-3. Pros: A good basic introduction to food and nutrition. The haikus and cheerful illustrations add fun touches. Cons; Food allergies receive a one-sentence mention at the bottom of the third-to-last page, and varieties on the USDA-recommended diet, such as vegetarianism or gluten-free, are not mentioned. A list of additional resources could have addressed some of those topics.